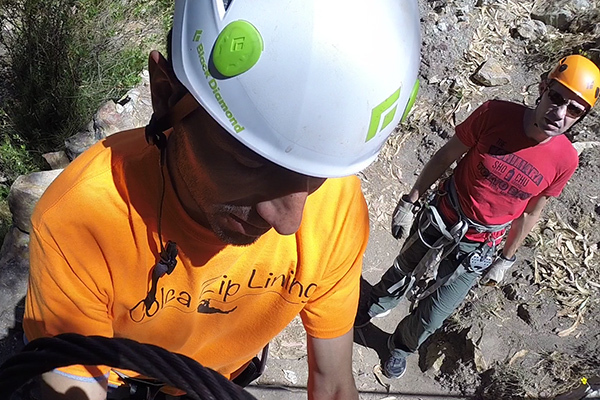 We, along with our cable comrades Rossana and Pedro, signed up for the full package. (We don’t like to do anything halfway.) Natan and his zip-lining sidekick David fit us with harnesses and helmets, and we were set to go. 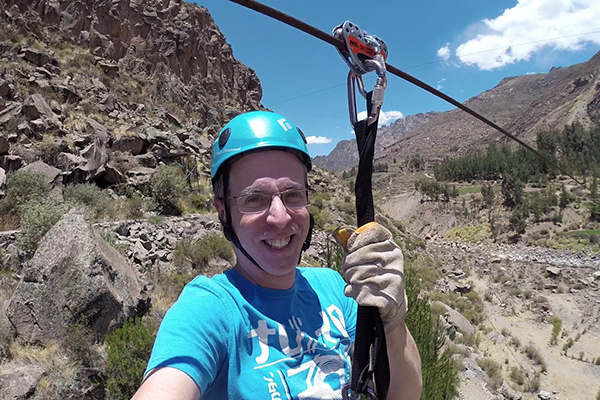 The zip line adventure caters to both newbies and experienced zip-liners. 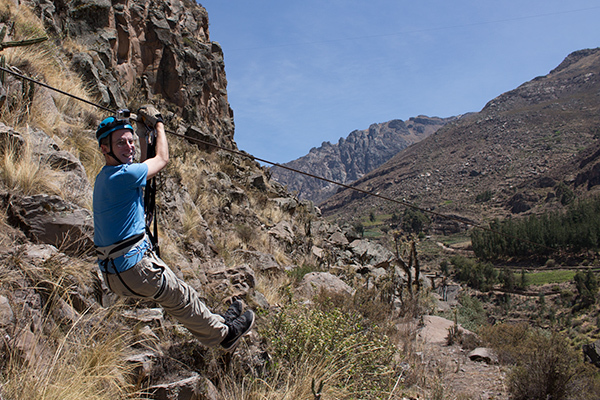 After zip line basic training, you hit the lower cables gliding through strands of eucalyptus back and forth over the canyon as well as some ancient terraces. The first lines are beautiful but relatively moderate runs that allow newbies to get their feel for starting and braking. For some people, the lower lines might be thrill enough. 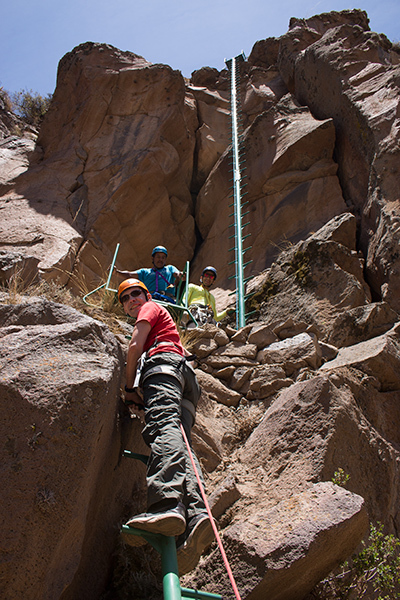 But zip line aficionados and those who love adventure will definitely need to keep climbing. And when we say climbing, we aren’t joking. Perhaps Nathan’s greatest creation (or should I say act of insanity) is the hair-raising ladders he built leading up to the platform for the Monster. Thomas had to practically go into a trance to suppress that old fear of heights. Hilariously, halfway up the ladders, Nathan stuck his head into a small cave and casually commented, “Hey, look at those big droppings – I wonder if a mountain lion is sleeping in there.” Excuse me? At the top, the thrills continue as they hook you onto the Monster and you shoot down the 500-meter cable soaring through the skies like a zip-lining god. Take a moment to gaze upon the mere mortals 100 meters below staring up at you in awe, worshipping your flight. (And watch as they run to the office to sign up for the next zip-lining trip.) The views are outrageous. If you dare, you can even do a 360 or two on the way down. But don’t forget to get those gloved hands ready to brake. Of course, there’s always the second option, which Rossana chose. 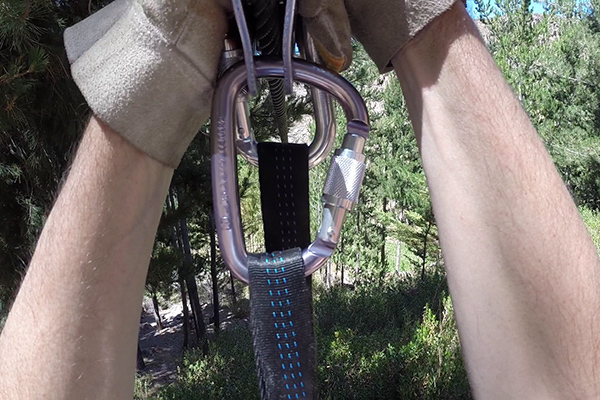 For zip-liners who don’t want to use the parachute, Nathan will hook you up to the cable and send you sailing down sans chute. He then races down behind you, grabs you mid-cable, and does a hard brake for two before arriving at the lower platform. Wow! 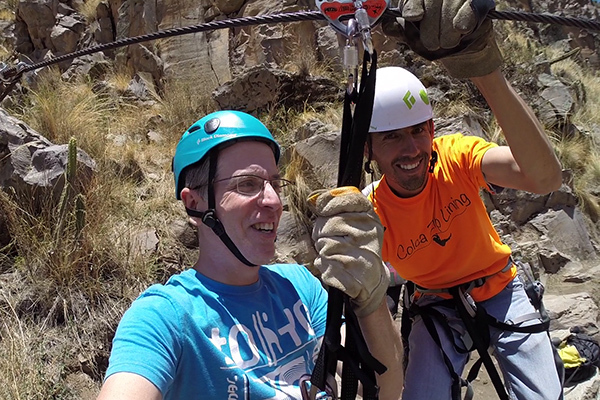 We thought Colca Zip-Lining was a total blast. 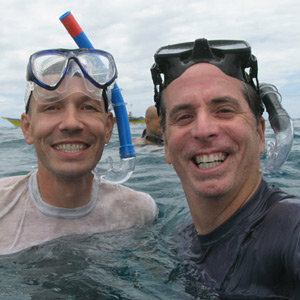 Nathan and David were a huge amount of fun and we enjoyed every second of this awesome experience. We can’t wait to see what they dream up next. 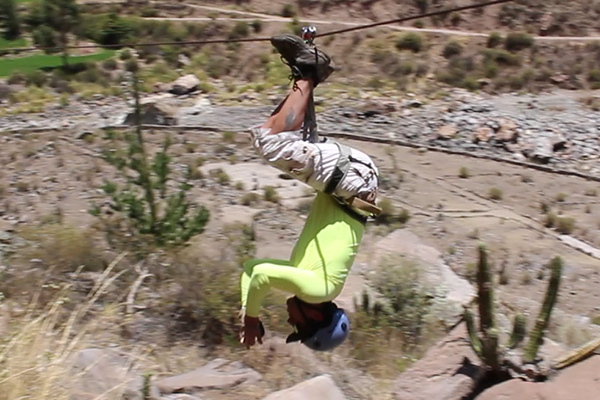 If you would like to find out more about Colca Zip-Lining and about the Monster, visit them at www.colcaziplining.com. 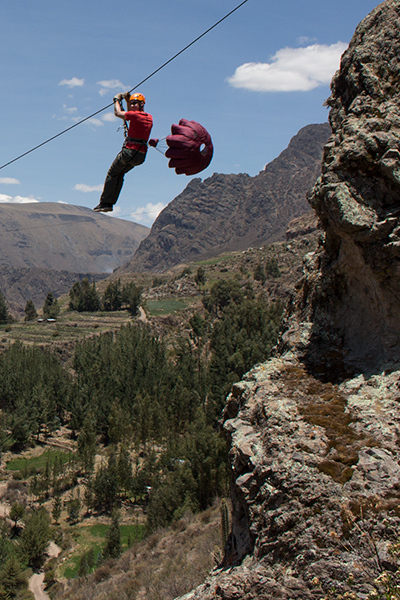 Disclosure: We were guests of Colca Zip-Lining during this experience. However, all of the opinions expressed here are our own. 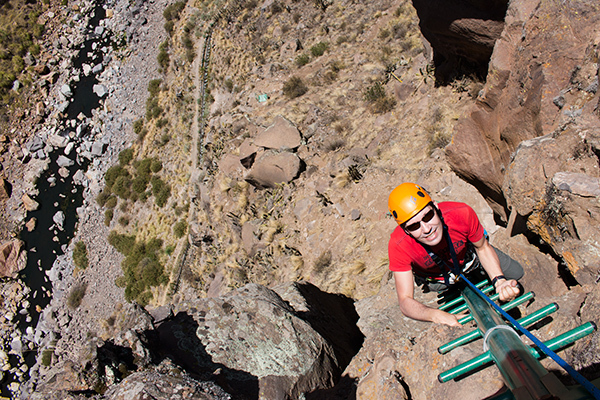 Can’t wait to do this when we visit Colca Canyon. You got me with the parachute. Added to our Peru list. Can I do the monster if I have never zip-lined before? It sounds really fun. Absolutely, you can do it. No special experience or training is required. Natan teaches you everything before the first run. You just need a sense for adventure. I’m not sure if the parachute is cool or terrifying.